Hi there! Here is another card I made using some of the brand-new products from the Occasions Mini Catalog for Ayden's birthday. Do you see the maze game on the front of this card? I stamped the cheese image in the center of the maze. Ayden wasn't quite sure what to do with the maze game but our oldest son Alec was so determined to get the two balls in the middle. I think Ayden was more interested in opening his presents!!! Finally! I had a chance to play with the brand-new products from the Occasions Mini Catalog a few days ago. My mom asked me to make a cute gift card holder for Ayden's birthday so this is what I made for him. Isn't it so cute? I love the new "Sweet Shop" Designer Series Paper and it's so perfect for him. If you know him, I'm sure you will agree with me! Thank you for your emails to wish Ayden a happy birthday. He really enjoyed your sweet words! 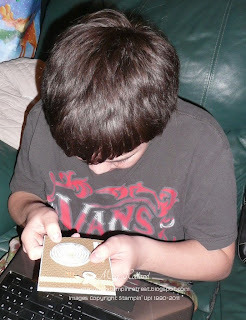 This gift card holder is super easy and quick to make. 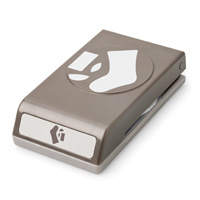 I used the Word Window Punch to insert a gift card. You know what? It's on sale right now online (while supplies last) on the Clearance Rack. Stampin' Up! has just added more items on the Clearance Rack. To go directly to my online store to view the Clearance Rack items, click HERE. New Scrapbooking Class Alert! If you missed my post of the new Christmas Scrapbook in a Day Class, click HERE to see the detailed description of the class. Thank you for stopping by. Have a fantastic day! Look who is turning 6 today....can't believe our youngest boy Ayden is already 6 years old. I still feel like he was just born! Where has the time gone by??? Anyway we have some plans for his big day today and hope he will have a blast birthday! I made this picture frame last year using the Stampin' Up! 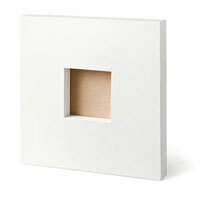 Chunky Frame which has been discontinued; however it is available right now on the Clearance Rack for only $7.99. This simple white frame is thick (1-1/2") and sturdy enough to stand by its own on a desk, or you can hang it on a wall. 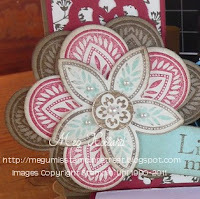 It's very easy to embellish with Stampin' Up! Decor Elements, Decor Stencils, paint, and more. It's a very quick and fun project to make. It will make a great gift too. Frame Size: 12" x 12" x 1-1/2"
Click HERE to go directly to the Clearance Rack at my online store. Hi everyone! I hope you all had a wonderful Christmas with your family and loved ones. We had a fun day filled with lots of laughs and good food with our friends on Christmas Eve and had a peaceful Christmas day at home. We have one more "big day" coming up in a few days for our youngest son. Can't believe he is turning six already! Got Christmas photos???? I don't know about you but I have a box full of Christmas photos from I don't know when and more saved on my computers that I really need to scrapbook. It gets overwhelming and I don't know where to start. So this is what I have come up with for you (and me too) - "Christmas Scrapbook in a Day Class"! YES! You will complete an entire scrapbook in a day! The class fee includes all the supplies to make this beautiful 20 pages, 6" x 6" Holiday Scrapbook featuring the Christmas Lane Simply Scrappin' Kit from the Holiday Mini Catalog. I will show you how to decorate your album cover with a big chipboard snowflake, a shaker frame and more embellishments. Plus I will show you how to use your leftover materials to make some 12" x 12" scrapbook pages. What to Bring to Class: Your basic tools, adhesive, and a portable paper trimmer (optional). Please contact me via email or phone to sign up for this class. Payment is required at the time of registration. Space is very limited. First come, first serve. Please register by January 2nd, 2012. The featured products (Christmas Lane Scrappin' Kit and Cherry Trim Ring Album) will not be available after January 3rd, 2012. If you would like to purchase additional Cherry Trim Ring Albums, please let me know ahead of time so that I can have them ordered and ready for you in class. Thank you for stopping by. Please contact me with any questions. Have a wonderful week! Hi there! I'm really exited to show you this Shaker Card we made at my Card Club workshops this month. It's so cute! The Stampin' Up! 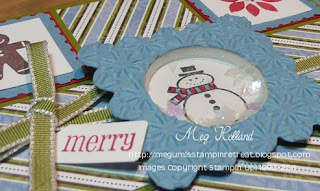 Shaker Frames (124155) from the Holiday Mini Catalog make it super easy to make any card a shaker card! Marina Mist card stock (card base) - cut to 4 1/4" x 8 1/2", scored at 4 1/4"
Old Olive card stock - 4" x 4"
Run a piece of Marina Mist card stock on Big Shot using the Scallop Square Duo die. We used the smaller size. Punch a hole using the 1" Circle Punch. 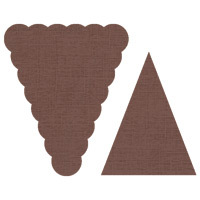 To do this, punch a scrap piece of card stock and adhere onto your Square Scallop die-cut piece in the center with the Dotto Removable Adhesive, and then punch it out. Emboss your Scallop Square with the Snow Burst Embossing Folder on Big Shot. Adhere a piece of Window Sheet (1-3/8" Square) to the back of your Scallop Square piece with Tombow Liquid Glue. Stamp the Snowman image using the Staz On Black ink on Whisper White card stock. 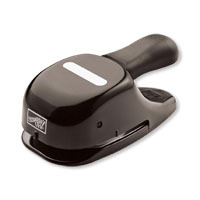 Punch it out with the 1-3/8" Square Punch. Color in his scarf with Marina Mist and Real Red Stampin' Markers. 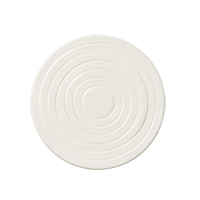 Carefully remove the 1-1/4" size foam circle from the Shaker Frame package and adhere onto your Snowman image. Do not remove the protective adhesive tape on top of your foam circle yet. Otherwise, your filler will stick to the adhesive part and will not be able to use the foam circle. 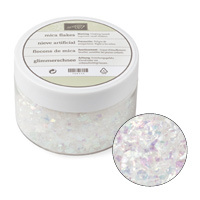 Carefully fill in the foam circle with a small amount of Mica Flakes. Now carefully remove the protective tape and place the Scallop Square piece on top. Your Shaker Frame is done. Set aside. This is the hardest part to make this card! Pick 4 of your favorite stamps from the Jolly Bingo Bits Stamp Set. They are all so cute! Stamp using the Stampin' Markers and then punch them out with the 1" Square Punch. 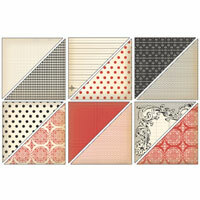 Layer them with Marina Mist Postage Stamp Punch-outs and Real Red square pieces. Adhere your stamped square pieces onto your 4" x 4" Old Olive piece as shown. Adhere your patterned paper square pieces as shown. Wrap around your ribbon and tie a bow as shown. 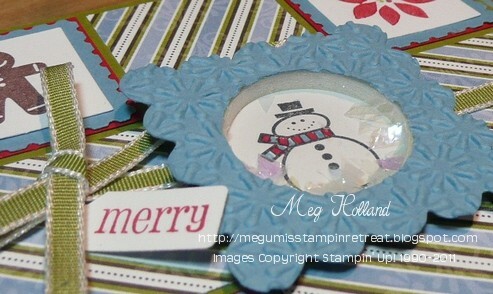 Stamp "Merry" on Whisper White card stock with Real Red Stampin' Marker and punch it out with the Jewelry Tag Punch. Adhere to your Old Olive piece right under the bow using Mini Glue Dots. Adhere your Shaker Frame to your Old Olive piece with Tombow Liquid Glue or Sticky Strip as shown. Adhere your Old Olive piece to your card front with Dimensionals. Your card is done! Please note: I'm not sure if the Shaker Frames and Mica Flakes will be carried over to the next Idea Book and Catalog at this time. They are not listed in the Occasions Mini Catalog. As far as I know for sure, they are available only through January 3rd, 2012. 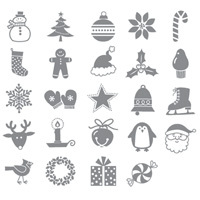 My Favorite "Jolly Bingo Bits Stamp Set"
Click HERE to go to my Online Store for Stampin' Up! supplies. Hi everyone! This is one of my favorite Christmas cards I made this holiday season. Hope you can see the trees-they are dimensional and they even get flat so that you can easily put it in an envelope. To make the dimensional tree, I stamped one of the pennant images three times on Old Olive card stock in Old Olive and then punched them out with the Pennant Builder Punch. I folded each piece in half and glue them together in the back using the Tombow Liquid Glue. The finished tree is then adhered to the embossed frame piece with Dimensionals. I tied a small bow using the Stampin' Up! 1/8" Taffeta Ribbon and adhered it to the tree with Mini Glue Dots. This is a fun Christmas card to make. In fact, my youngest son really enjoyed making it for his kindergarten teacher. Along with this card he gave her a 2012 Planner which I decorated with some designer series paper and personalized it with her name. I hope she liked it. Here is the one I made for me. I can't live without one of these to help me organized with my own workshop schedules plus busy family activities. I haven't converted myself to a digital one yet! I still like this way and even write things down in pencil!!!! This "Love Letter" Designer Series Paper" is discontinued but is available on Clearance Rack right now. The Stampin' Up! Clearance Rack Blitz promotion is still going but they are disappearing quickly. Remember those items are available online while supplies last. Please click HERE to go directly to the Clearance Rack Blitz at my online store and start shopping. A NEW ANNOUNCEMENT FROM STAMPIN' UP! Stampin' Up! has just announced that they will not carry over the Stocking Builder Punch (124095) from the 2011 Holiday Mini Catalog into the next Idea Book and Catalog. Once the current inventory of this punch has been depleted, it will no longer available for purchase. So if you don't have the punch and it's on your wish list, I'd say this is your chance to grab one before it's too late! I'm really sad about this news but they are looking forward to offering other great designs in its place- -not to mention a trendy, a new design planned for next holiday season. This is a quick and easy tag to make using the Two Tags Die and Stocking Builder Punch. 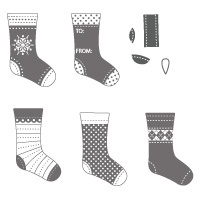 The Stocking are embellished with a piece of Cherry Cobbler Baker's Twine and a Mini Jingle Bell. Aren't they cute? Hi there! This is a kind of unique scrapbook project we did this month for our Scrapbook Club workshop. I wanted to incorporate scrapbooking and calendar as a gift so this was what I came up with. It's an easel calendar with a drawer underneath so that you can store things in the drawer. The easel part becomes flat making it easier to ship. I was looking for a perfect picture for this project preferably a female in it because of the feminine design of this project. My mom must have read my mind! Oh, it's scary - she is in Japan and I'm here in US! Anyway, I received a package from her and here it was - a photo of her and my nieces. Aren't they cute? They are really great kids, very smart and athletic. They are good at anything just like their mom! No kidding! Happy Monday everyone! Hope you had a wonderful weekend. Here is a cool idea for your wine lovers. I used the Stampin' Up! 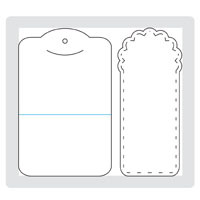 Two Tags Die for the base of the tag and embellished with stamp images, die-cuts and ribbon. This is really quick and easy and you can mass produce tons of them in no time! To make this Cherry Cobbler tag, I punched a hole using the 1 3/8" Circle Punch at the scalloped circle end of the tag. In order to punch at the right place, I first punched a pieced of scrap paper with the 1 3/8" Circle Punch and secured it on the tag with the Dotto Removable Adhesive (103305) and then punched it out. I used the Stampin' Up! Simply Scored Scoring Tool to score at about 1/4" below the circle to fold at the score line. This way the tag will rest nicely on the wine bottle. I ran a piece of Garden Green card stock on Big Shot using the new Stocking Accents Die (124099) and then embossed with the new Snow Burst Embossing Folder (124096). I punched the Stampin' Up! Red Glimmer Paper with the Itty Bitty Circle Punch and adhered them with Mini Glue Dots. 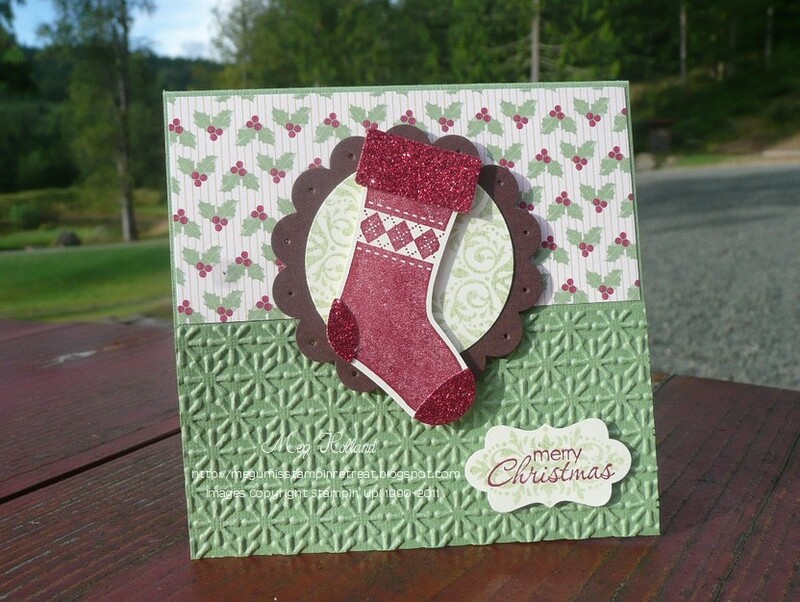 The background patterned paper is the Frostwood Lodge Designer Series Paper from the Holiday Mini Catalog. To make this Garden Green tag, I punched out at the straight edge end of the tag with the 1 3/8" Circle Punch. I stamped the "Joy at Christmas" image in Garden Green and then in Cherry Cobbler on Whisper White card stock. I used the Scallop Circle Punch (119854) to punch out the Cherry Cobbler image and punched out the Garden Green image with the 1 3/8" Circle Punch. I took the "Joy at Christmas" circle piece and adhered it onto the Cherry Cobbler Scallop Circle piece with Dimensionals. I finished it with my favorite Cherry Cobbler Seam Binding Ribbon. Thank you for visiting today. I hope you like my cool wine bottle idea! Have a wonderful week! 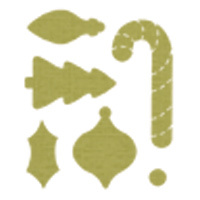 Stocking Accents Originals Die (124099) - My Holiday Favorite! Two Tags Die (115954) - Must Have Die!